Here, we present dialogues with key phrases and expressions for successful meetings. We begin with how to start a meeting and look at an agenda. You'll also find expressions for presenting information, expressing an opinion and agreeing. And of course: ending meetings. For a list of all the key phrases used in the dialogues, click the box labelled “phrase bank“ below the dialogues. The Situation: Arnie Wilson, head of the human resources department of sports­wear company Rush, has called a meeting to discuss and begin organizing a reward event for 100 of the company’s sales representatives. Arnie: Good morning. Is everyone here? Bill: Val’s on her way. She said we should to go aheadfortfahrengo ahead. Arnie: OK. Now, we’ve to schedule (an hour)(eine Stunde) einplanenscheduled an hour for this meeting and we have quite a few items to discuss. As the last item on the agenda isn’t pressing, I would suggest we talk about it next week. Is that OK with everyone? Carlo: That’s fine with me. Arnie: Carlo, would you mind taking the to take the minutesdas Protokoll schreibenminutes? Carlo: Not at all. Ah, here’s Val. Val: Hi. I’m so sorry I’m late. Bit of a crisis, but it’s been sorted now. Arnie: That’s OK. Don’t worry about it. Good. Let’s get started then. Arnie: Right. So, the first and main point on our agenda is organizing the reward weekend for our sales reps. Bill, could you remind us what the briefAuftrag, Instruktion(en)brief is, please? Bill: Sure. Well, as you know, we want to send all 100 reps on an unforgettable weekend trip at the end of November. We want an action-packed, motivating and inspiring trip — with plenty of partying, too. So, we need to decide on a destination ASAP, bearing in mind that we need one hotel with availability for 100. Val’s been looking into our options. Val: Yes, thanks, Bill. I’ve been in contact with an agency called Destination WOW! and they’ve to set sth. outetw. darlegenset out three possible solutions that would be within our budget — well, one’s slightly over. Arnie: Great, I can’t wait to hear what they are. Val: So, as I mentioned, we have three possible destinations. First of all, I’ll set out all three destinations and then I’ll go into more detail about the location, logistics and activities later. So, one possible destination is... Venice. The sales reps will be staying at a luxury hotel at the Lido. Activities will include kayaking during the day, and dining and partying in Venice in the evening. Carlo: I like the sound of that!Das klingt gut!I like the sound of that! Val: I thought you might. The next destination is Iceland. The luxury lodgingUnterkunft, Quartierlodgings are at the famous Blue Lagoon, and activities include a guided ice hike and husky sleddingSchlittentoursledding. Val: And last but not least, we have a ski trip to Norway. The team will sail to the fjords of Lofoten where they will go skiing. And then there are the Northern Lights, and plenty of après-ski fun, too. Arnie: Thank you, Val. We seem to have three fantastic options there. What does everyone think? Bill? Bill: I agree, Arnie. They all sound great. For wow-factor, I’d to go for sth.sich für etw. entscheidengo for the ski trip to Norway. I think that’s something you wouldn’t do with your family and it sounds like a once-in-a-lifetimeeinmaligonce-in-a-lifetime experience. Carlo: I agree that Norway is the most attractive and inspiring destination, but there are some details I’m worried about. Plus, it is the most expensive of the packages. Arnie: Yes, I can see what you’re saying. Val, is there anything we can do about the price? Could we tweak sth. (ifml.)etw. leicht veränderntweak any of the activities? Val: I could definitely talk to the agency again and ask what they’d recommend. Arnie: OK. Could you do that then, and see if we can get the Norway trip more in line with our budget? Val: Yes. No problem. I’ll give them a call after the meeting. Arnie: Am I right in thinking that everyone’s favourite is Norway? Arnie: What about you, Carlo? Carlo: Well, as long as we can stay within our budget, I’d say let’s go for it. For me, Venice would also be an option, but I guess most of the sales reps have already been there. Arnie: OK, now let’s talk about how we’re going to announce the trip and how we can make sure all the reps are available. Carlo: I thought we sent out a to save a dateeinen Termin freihaltensave-the-date mail, didn’t we? Bill: Yes, we did. Val was talking to the agency about a teaser video. Right, Val? Val: Yes, that’s right. A video is one way we could announce the trip. The agency would put together a teaser video with clips of activities and locations. The video would be “brand-infuseddurchdrungeninfused”, as the agency to put sth.hier: etw. formulierenputs it. Arnie: Fantastic. We could show the video at the next sales meeting. When is that? Carlo: Out of interest, are the agency’s feeGebühr, Honorarfees included in the prices you showed us earlier? Oh, sorry, Arnie. I interrupted. Arnie: That’s all right. It’s a good question. Val: Yes, the fees are included. Bill: The next sales meeting is next week. Arnie: Is that enough time for the agency to get the video ready? Val: I’ll check with them. Arnie: OK. It’s almost 3 p.m. Does anyone have anything they want to to raise sth.hier: etw. vorbringenraise, or can we finish up now? Val: I think we’ve covered everything. Arnie: I think so, too. We’ve decided on the trip to Norway, as long as the agency can deliver the package within budget. Val, you’re going to take care of that. And we’ll be announcing the trip at the next sales meeting in one week. Val, you’re going to make sure the video can be ready in time. I think you and I should to go along to do sth.hier: als nächstes etw. tungo along to make the announcement, OK? Arnie: And Carlo, you’ll write up the minutes. Do you think you could do that bybis (spätestens)by midday tomorrow? Carlo: That shouldn’t be a problem. Arnie: Good. Well, thank you all for your help-ful contributions. That was very productive. In this section, you’ll find a selection of phrases and expressions used in the dialogues. We’ve scheduled an hour for this meeting. Carlo, would you mind taking the minutes? What does everyone think? Bill? Does anyone have anything they want to raise? So, as I mentioned, we have three possible destinations. First of all, I’ll set out all three destinations. I would suggest we talk about that next week. A video is one way we could announce the trip. We could show the video at the next sales meeting. I think you and I should go along to make the announcement, OK? Bill, could you remind us what the brief is, please? Could you do that then? Do you think you could do that by midday tomorrow? Am I right in thinking that... ? We seem to have three fantastic options there. I’d go for the ski trip to Norway. For me, Venice would also be an option. I guess most of the sales reps have already been there. I think Norway is definitely a more surprising choice. I agree, Arnie. They all sound great. Yes, I can see what you’re saying. Well, as long as we..., I’d say let’s go for it. There are some details I’m worried about. Oh, sorry, Arnie. I interrupted. That’s OK. Don’t worry about it. That’s all right. It’s a good question. I thought we sent out a save-the-date mail, didn’t we? I could definitely talk to the agency again. I’ll give them a call after the meeting. We’ve decided on the trip to Norway. Val, you’re going to take care of that. Well, thank you all for your helpful contributions. 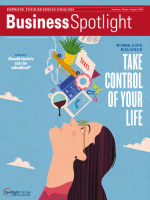 Dieser Beitrag stammt aus dem Magazin Business Spotlight 5/2016. Die gesamte Ausgabe können Sie in unserem Shop kaufen. Natürlich gibt es das Magazin auch bequem und günstig im Abo.